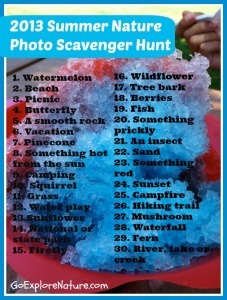 Here’s how the photo scavenger hunt works: I’ve come up with 30 things you and your kiddos can hunt for outside this summer. Find an item, snap a picture and check the item off your list. Will you be able to find everything before summer is over? Don’t worry if your little explorer isn’t an aspiring photographer or sometimes needs your help to snap a shot. The point is to get outside exploring! 1. 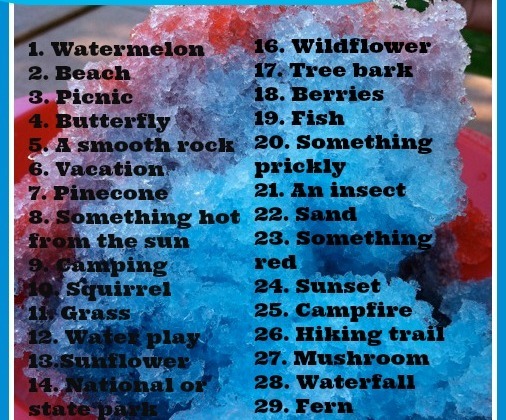 Print out the free Summer Nature Photo Scavenger Hunt list. Post it somewhere you’ll see it every day. Then head outside and into nature with your family and start exploring! 2. Use the hashtag #summernaturehunt if you’re on Instagram. 3. If you’re on Pinterest, leave your username in the comments below & follow any of my boards. I can then invite you to add your photos to the Summer Nature Photo Scavenger Hunt board. And if you’d love to play along but have no desire to share your photos publicly, please do so! At the end of summer, you’ll have a wonderful collection of memories perfect for a photo book. Yay! Heading over to check it out now! Thanks so much for spreading the word, Sharra. Glad to have you playing along! Can&#39;t wait to see your photos, Robin! Have fun! I love this idea. We will have to warm up the camera and get out there looking for these things. I don&#39;t know if I&#39;ll post, but I am crafty_cristy on pinterest. Yay – can&#39;t wait to see your photos! Thank you so much for sharing, Barb. Hope you have fun playing along! Love it! Shared it on Pinterest and printed my list. 🙂 Thanks Debi. Yay – your invite is on its way. Looking forward to this again! I couldn&#39;t get to all the spring ones :(. HOpefully we will do better with the summer.